The BSBCC has 29 dedicated full-time staff who run and assist in the centre's operation. They rise to the challenge of taking care of the welfare of 43 sun bears and have a lot of fun too! 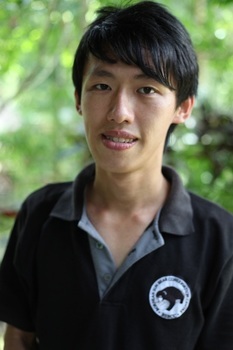 Dr. (Hon) Wong Siew Te, founded the Bornean Sun Bear Conservation Centre in 2008 and is the drive behind the project. 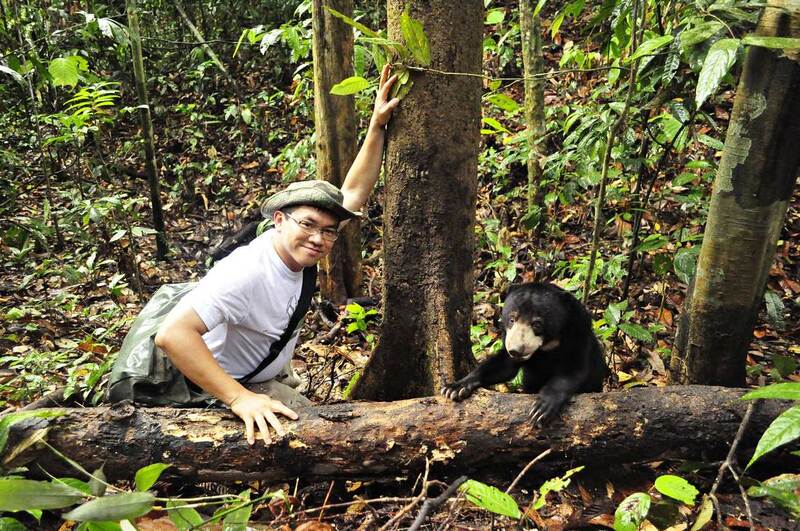 Wong, one of the few Malaysian wildlife biologists who was trained in Taiwan and U.S.A., has been studying and working on the ecological conservation of the sun bear since 1998. His pioneer studies of sun bears in the Bornean rainforest have taken him into the most threatened wildlife habitat on Earth, where field work is exceedingly difficult. Witness to many captive bears - cubs and adults - kept in small cages, unhygienic and often disgusting conditions in zoos, farms, private menageries, and private homes - almost all of them suffering from serious stereotypic behaviours: relentless pacing and circling, obsessive licking and other disturbing behaviours. Seeing sun bears in these dreadful captive conditions combined with his 'animal welfare and veterinary' education and his love for sun bears, Wong was inspired to set up the Bornean Sun Bear Conservation Centre in 2008. 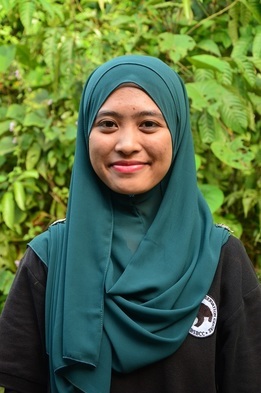 ​"I am determined to help Bornean sun bears. The challenge is huge, and I cannot do this alone. I need help, support and allies. Every voice counts and together we can make a difference." 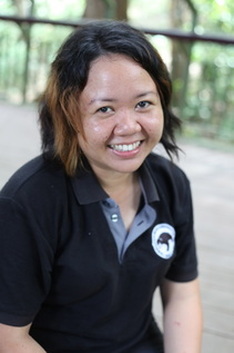 Wildlife Biologist, Tropical Forest Ecologist & Sun Bear Expert; CEO & Founder, Bornean Sun Bear Conservation Centre. Raised: Penang, northern Peninsular Malaysia. Philosophy of Doctor (Incomplete). Fish and Wildlife Biology, University of Montana, Missoula, Montana, U.S.A. (2002-2011). Honorary Doctor of the University. University of Sunshine Coast, Sunshine Coast, Queensland, Australia. 2016 Honorary Award of Doctor of the University. University of Sunshine Coast, Queensland, Australia. 2015 Nature World Heroes, November 2015. 2014 2014 Outstanding Alumni Award, National Pingtung University of Science and Technology, Pingtung, Taiwan. 2014 Conferred “Darjah Johan Negeri” (DJN) (Member, Order of the Defender of State) by the Governor of Penang. 2012 Recognized as a wildlife hero featured in the book Wildlife Heroes: 40 Leading Conservationists and the Animals They Are Committed to Saving. 2009 Bertha Morton Scholarship, University of Montana. US$2,000. The University of Montana Graduate Student Travel Award. 2006 Best Student Project Award in Training Course on Advanced Techniques in Frugivory and Seed Dispersal, Yunnan, China. 1997 James C. Salinas Scholarship, University of Montana. Role: Provide veterinary care for the captive sun bears and other wildlife. Advice on bears' husbandry management. What do I think of BSBCC? Role: In charge of rehabilitation operation, taking care of captive sun bears by improving their condition and welfare. BSBCC has the potential to grow, expand in wildlife conservation, especially in terms of sun bears. I want to work with sun bears because it is the least known species not just in the world, but in Malaysia. By simply saving one species, the whole ecosystem would be healthy. Role: Organise educational activities, writing reports and developing educational displays. I have always wanted to work with animals since very young. Every day at the centre is a learning process for me and through these years I have learnt so much about wildlife and the rainforest. I have always felt lucky to have the opportunity to work here. Role: In charge of all the sales, company license and administration. 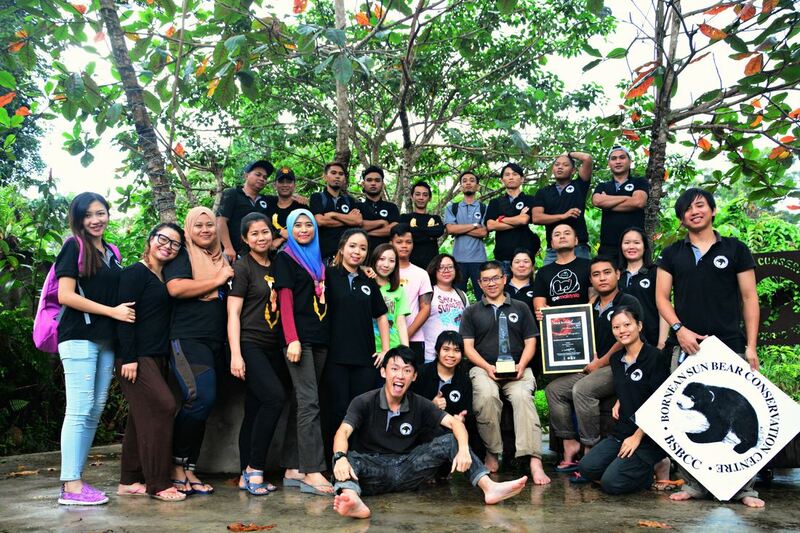 BSBCC is a non-profit organisation doing charitable good work to save sun bears for the future generation. I also like BSBCC for its close proximity to nature. Role: Handling company financial, accounting matters and payroll. Love to work in nature environment and friendly colleagues, that's why I am here - BSBCC. Role: Taking care of quarantined bears (especially baby cubs), managing the process of bear rehabilitation and reintroduce rescued sun bear back to the wild, collecting observational videos and also dealing with bear medical problems. It is amazing to keep fighting in the passionate and determined way you do. I realized that the sun bears need more attention and I am very grateful that I have the privilege of helping the sun bears. Role: Assists Gloria, the Environmental Education Executive in planning education programme, writing newsletters, managing adoption programme and also facilitating visitors. Coming to BSBCC, I can enjoy working with nature, learn about sun bears up close and the most interesting part for me is talking /conversing with visitors and telling them all about sun bears. Role: Coordinating in bear husbandry and rehabilitation programme. ​ In charge in volunteering programme. I feel very lucky to work here in BSBCC as it’s a good opportunity for me to learn. Keep calm and enjoy the environment. Role: Taking care of quarantined bears, especially baby cubs, managing the process of bear rehabilitation and reintroduce rescued sun bear back to the wild (electric fence training, integration and releasing into forest enclosure), collecting observational videos, dealing with bear medical problems and in-charge in volunteering programme. Sun bear is the least known bear species in the world. I hope my care can help this little known bear species- Sun bear! Role: Handling visitors queries & provide awareness, besides assisting in planning and conducting environmental education programmes as well as outreach programmes. BSBCC is certainly on the right path by incorporating multiple fields such as tourism, awareness, and research into its main purpose. The associations between outreach and wildlife must not be ignored as it is crucial for the survival of the endangered species, such as the vulnerable Bornean Sun Bear! Role: Coordinate visits by special interest groups and VIPs, handling visitors queries & provide awareness, besides assisting the Education Officer on education programmes. Animals have the rights to be protected and respected, that's why I'm here! Role: Involve in husbandry routines, medicating, enrichment set up, bear reintroduce, maintaining the centre and reporting. At BSBCC, I can learn a lot on the sun bear, the smallest bear in the world, and I want to continue understanding more about their lives. Role: Assist Bear Keepers in husbandry routines, medicating, enrichment set up, bear reintroduce, maintaining the centre and reporting. I like to work with animals. Before coming to BSBCC, I have worked with conservation on Rhinoceros. Therefore now, I want work with sun bears in BSBCC to gain more knowledge on animals. BSBCC is a platform for new generation to start anew with nature, feel the environment, work with animal and spread awareness to people on the importance of wildlife. I find that I started to love working as a team in conserving the Bornean sun bear and it is a career that I can learn more about sun bear habitat and the population. Another door to another achievement. I like this kind of job and I love sun bears! Role: Keep the centre clean and safe, this includes general cleaning, repairing and maintaining everything in the centre. 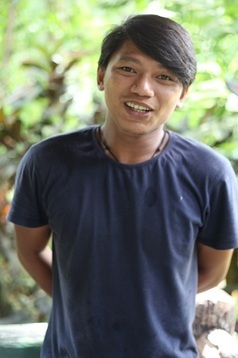 Born in Kota Kinabalu, raised in Sepilok, Sabah. BSBCC is close to my home and I like working there near the forest and looking at the beautiful bears. Role: Keep the center clean and safe, this includes general cleaning, repairing and maintaining everything in the centre. I want to help the sun bear and protect them for our future generation. A great platform where I can learn more about wildlife. Role: Taking care of bear cubs and assisting in the Tabin Research Project. I want to know more about sun bears. I like working in field and hence, I want to help in the research project on sun bears. Role: Providing information on the bears and centre at the reception and on the platform, selling entry tickets and merchandise and stock taking. The CEO of this centre is a nice guy, the staffs are very friendly and it is a good working environment overall. I love to work here because I want to know and understand more about conservation, and take part in the efforts to save sun bears! ​Proud to be able working in the nature environment and share information to the public, then you will understand everything better. Save The Sun Bears!